Nondalton is within the Lake and Peninsula Borough, whose ordinances include modest taxes for guiding businesses utilizing local fish and game resources. All Lake and Peninsula Borough communities benefit from these revenues. Information released to municipalities under HB 267 will remain strictly confidential, with serious criminal consequences for any unauthorized disclosure. House Bill 267 passed the Alaska House of Representatives by a vote of 27-12. The Alaska State Senate passed the bill by a vote of 17-3. 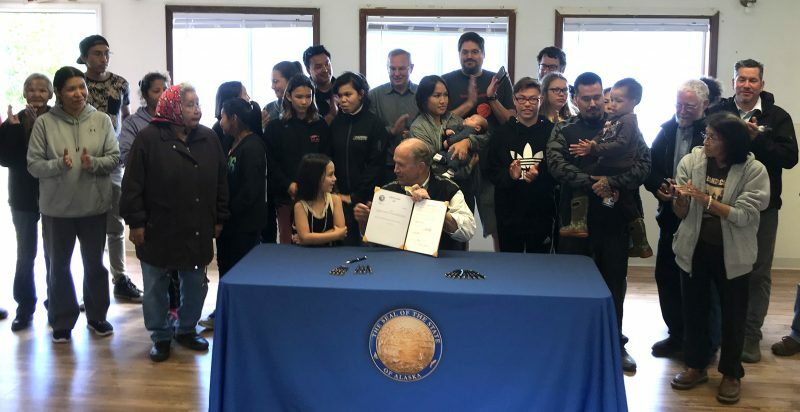 Alaska Governor Bill Walker signed HB 267 during a ceremony Tuesday in Nondalton. For more information, please contact Tim Clark in Rep. Edgmon’s office at (907) 465-4451.